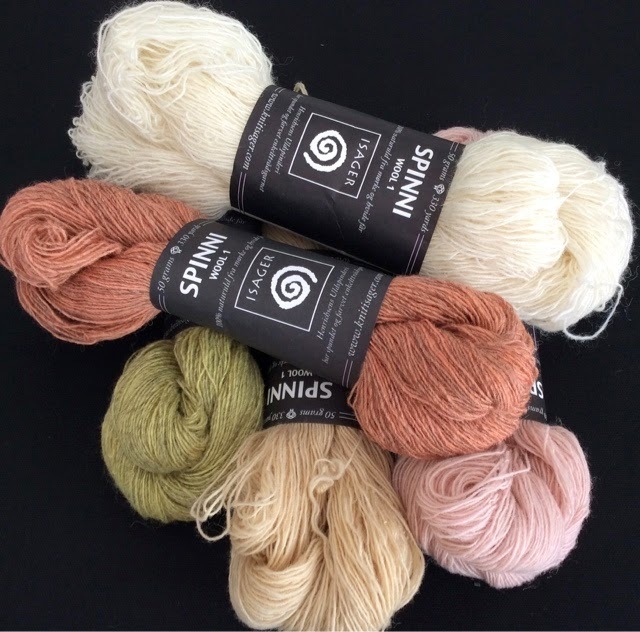 The Minnesota Textile Center is a favorite place for enthusiasts of all things fiber. They have several galleries, an amazing library, a shop, a dye lab that can be rented by members, classroom and lecture space. In addition, the Minnesota Handweavers have a large space filled with rooms and weaving equipment. When I hit Minneapolis and St Paul it is always a stop and a place I like to support. Every spring they have the Textile Garage Sale which is a great place to pick up used equipment, fabric, yarn, thread, patterns and books. There is also a silent auction for larger pieces of equipment (looms, knitting machines, sewing machines, etc) This year I am happy to say I won the bid for a serger. I'm still learning how to use and it's been more fun than frustrating. Vintage textiles were also in my shopping basket. 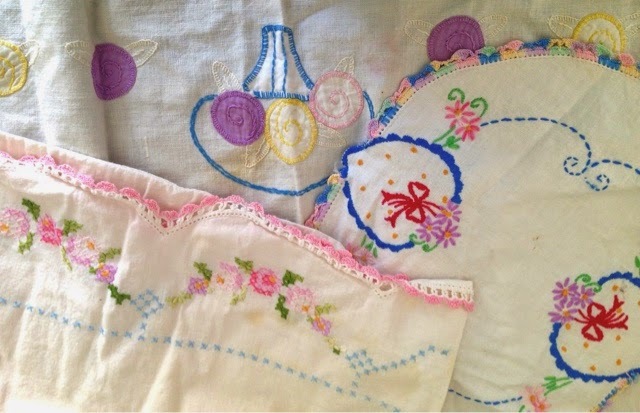 There is a great pin on Pinterest for some brooches of old embroideries so I will give that a go. 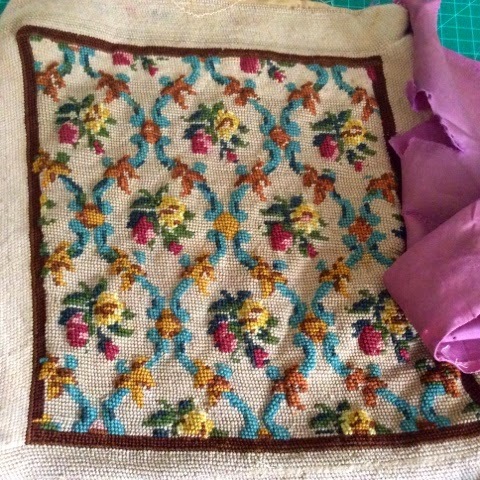 The needlepoint was to be remade into a new pillow but it needs a lot of TLC. After removing the old rotted backing I gently washed it and blocked it. The more I worked with it the more problems I was finding. 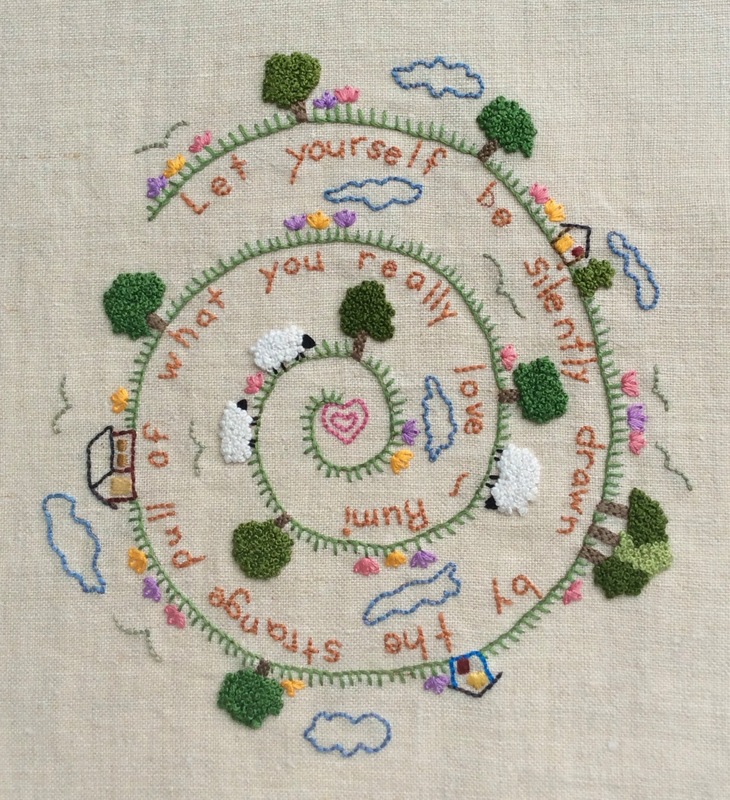 It was made with two colors of yarn, one wool, one acrylic, there are lots of missing stitches and it is wonky. The pillow idea has gone by the wayside and smaller pillows or pincushions are more likely. If you have any ideas for what this might become I welcome them! Please forgive the upside down orientation of this image...computer glitch that I cant seem to fix. For the third year in a row my sister-in-law and I have gone to the Minnesota Yarn Shop Hop and the Textile Center's Garage Sale. It is our fiber filled rite of spring. The Yarn Shop Hop features 17 yarn shops in and around Minneapolis and St Paul. Not only is it a great way for friends to get together and explore the yarn shops, it is also a fundraiser for local food banks. This year $37,500 dollars were raised - yahoo! Each shop provides a free pattern (of which many can be found in their Ravelry stores) and special yarns to go with the pattern. 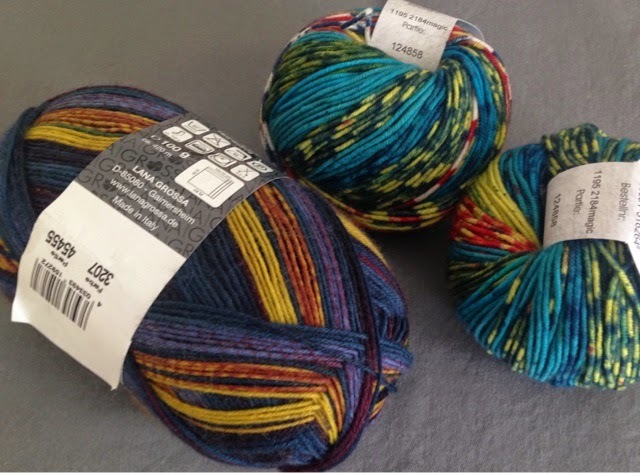 This year I found some beautiful yarn for a shawl called Aranami (find the pattern here), some socks and the scarf below. 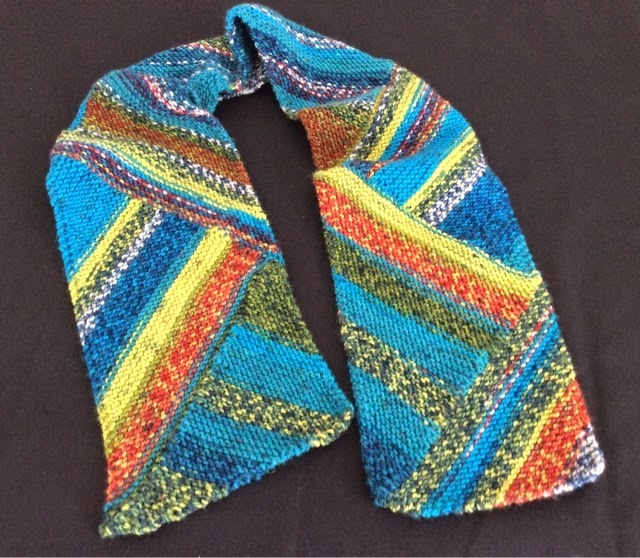 The scarf was super-simple, easy-peasy and the pattern is free. I used Schoppel Ambiente a self striping yarn - a bit heavier than sock yarn but any yarn will do. The trick is to use the size needle the yarn calls for and not what the pattern suggests. Here is a link to the pattern. If you try out the scarf I'd love to see a photo! Next time - the highlights of the Textile Center's Garage Sale!